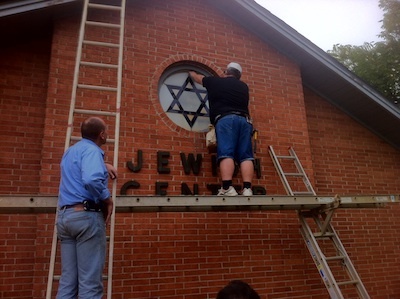 On October 6, 2012, the Union City Jewish Center was dismantled. 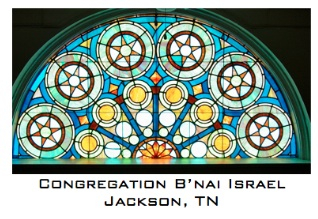 The Star of David window, their Torah, memorial boards and plaques, 2 standup menorah lights, contents of their library, their ark and ner tamid (eternal light), their stand up podium, the large cast iron letters that made up their external sign, and other objects have become a part of Congregation B’nai Israel’s permanent historical display. A unification service was held December 5, 2014, at Congregation B’nai Israel honoring the Union City Congregation and dedicating their Torah. 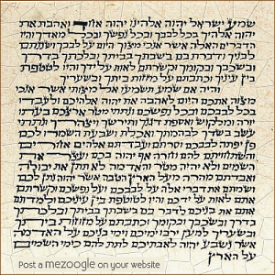 Click here for a history of the Jewish Center in Union City from The Goldring-Woldenberg Institute of Southern Jewish Life’s Encyclopedia of Southern Communities.